Whether it's birthdays, anniversaries, Christmas, or whatever special occasions you may celebrate, gift-giving can get really expensive. Not only do we have the actual gift to worry about, we still have the added expense of gift wrap, tissue paper if needed, and the greeting card. It all adds up and can really hurt the wallet! 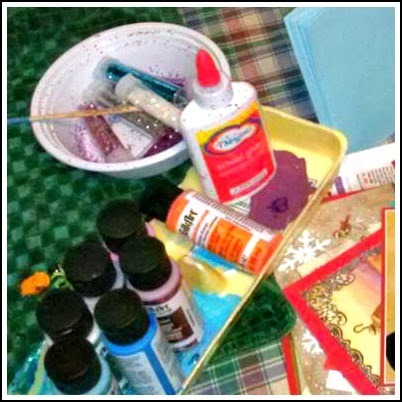 Today, I share a crafty idea from my super-frugal cousin Wednesday. 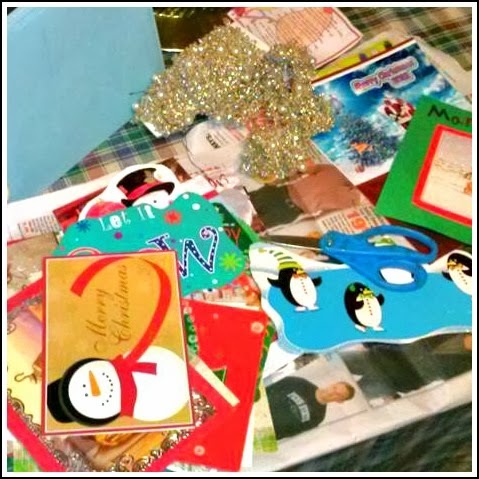 Knowing her kids wanted to give out Christmas cards to their friends at school, she gathered up some craft supplies and allowed her kiddos to create handcrafted cards. Perfectly customized to match the personalities of both the creator and the recipients! All while repurposing those old Christmas cards you received in the mail last year and packed away with your Christmas decorations! 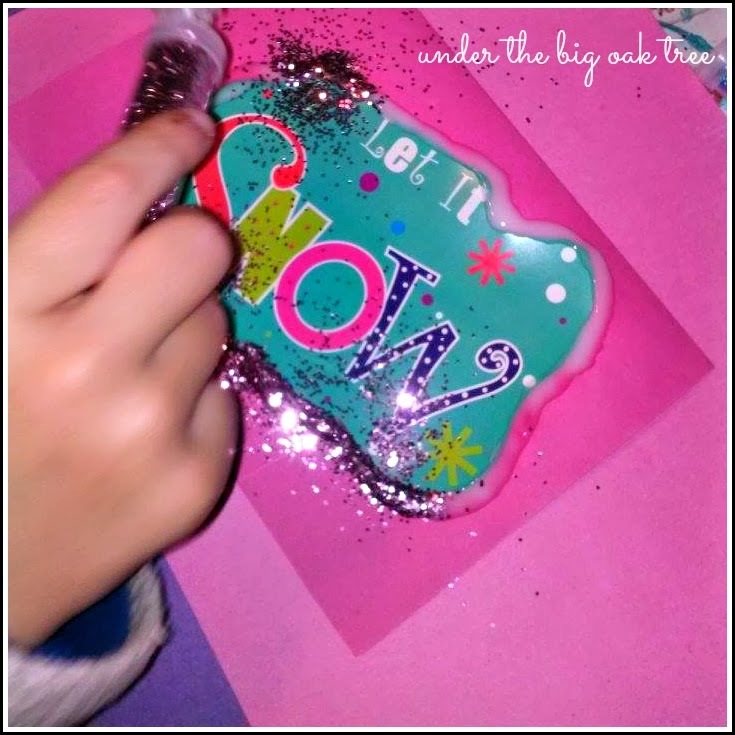 In addition to the saved cards, you'll also need scissors, school glue, glitter and whatever other embellishments your kiddo wants to add to their cards. You'll also want to gather some card stock or construction paper. Let your child start by choosing the greeting card he/she would like to repurpose and have them cut out the design from the front of the card. Depending on the age of your child, you may need to help them with this step. Once they have their design, they can choose coordinating card stock and fold in half to create the card form. With some school glue (or glue dots), they can attach their greeting card design to the front of the card stock. Then they can embellish however they wish! As you can see, M chose to use purple glitter to customize her greeting card! She traced the outline of the recycled card with some glue, then sprinkled with glitter. She then shook off any excess glitter and allowed to dry. Having fifteen or more cards to give out in class, this project can keep your kiddos happily occupied for quite a while. And you get to save a trip to the store to pick up those expensive store-bought cards with whatever character brand is popular at the moment! Not to mention those card packs never have enough to cover the whole class, so you end up having to buy multiple packs. And if you have more than one kiddo giving cards to their classmates...look out! It gets way to costly! 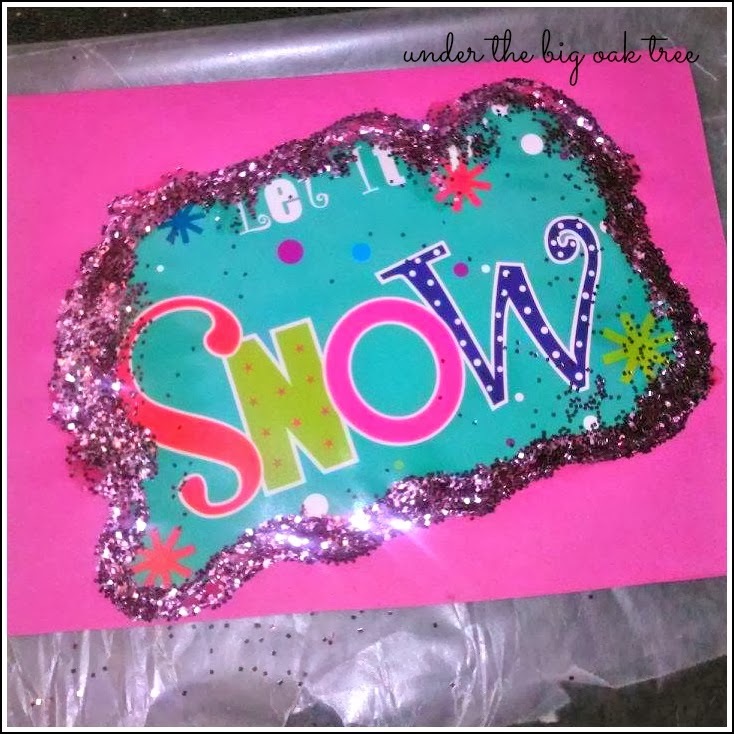 Oh, if you're not the type to hold onto cards from Christmas Past, you can still do this project with your kids on the cheap. Just pick up a box of assorted Christmas Cards from the dollar store! The kids can still cut them up to create their custom cards and you won't have to search your home office for envelopes! This is not just limited to Christmas. Once your kiddos reach school age, the invitations to birthday parties start rolling in! Some friends have multiple parties on the same weekend! Sometimes even the same day! Adding up to several in the same month! Again, the cost of birthday cards alone can really break the bank! 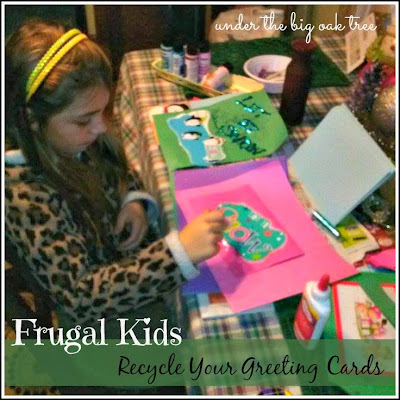 Start saving old greeting cards and let your kids create homemade cards to attach to their gift to the birthday kid!